Sir Garfield Sobers is not a person to be easily overlooked. Yet, when the greatest allrounder called on the Sri Lankans, as they trained before the second semi-final of the World Twenty20 at the Oval, Tillakaratne Dilshan had no idea who he was exchanging pleasantries with. "I just said hello," Dilshan says with an embarrassed smile. Sanath Jayasuriya, standing next to Dilshan, realised his younger team-mate didn't know who the visitor was. "He was shocked," Dilshan chuckles. "I never seriously followed cricket when I was young," he says. The first live cricket match he watched was on TV - the last 10 overs of Sri Lanka's momentuous 1996 World Cup triumph over Australia. Dilshan was at a family wedding when people in one corner perked up as they watched Aravinda de Silva tear the Aussies to shreds. Something stirred inside Dilshan. Relaxed, attentive, at ease, not unduly modest, Dilshan exudes confidence. His innovative, outrageous scoop shot into the no-man's land behind the wicketkeeper, christened variously "the Dilscoop" (Dilshan prefers this) and "the starfish" has become the talk of cricket. "I now have a shot in my name, na," he says in the trademark sweet Sinhalese tone. The sparkle in his eyes cannot be missed. Hours after our meeting Dilshan went on to script a memorable and considered 96 to take Sri Lanka to the final. Unfortunately, two days later he failed in the big game against Pakistan, pull-scooping lamely and returning with a duck. "There were only two matches I didn't get runs. I am really disappointed in myself that I didn't do my best in the final," he said after the defeat. Still, he finished as the best batsman in the tournament, with the most fifties and fours. From being a fringe player and then a bits-and-pieces one who batted at nearly every position in the order, Dilshan seems to finally have nailed the opener's slot in ODI and Twenty20 cricket. His batting is not about thwacking; it rests on a more measured approach. His shot selection is precise and he can switch between the roles of anchor and attacker without much sweat. "He is someone who needs to be kept on the edge," Paul Farbrace, Sri Lankan's assistant coach of two years, says. According to him, Dilshan may take 10 balls for 10 runs, but if he faces 30 balls he will score 50; his strike-rate rises with the amount of time he spends at the crease. "He is one of the best counter-attackers in world cricket," Farbrace says. "He has such belief in his own ability and is very strong-minded, and sometimes that's his downfall. But every top player has that inner belief that they are going to do well on that particular day. Dilshan has that in abundance." "I realised I wanted to cement one spot," Dilshan says, leaning forward on the couch to make himself heard above the din in the hotel lobby. "Opening was the best slot because Sanath will retire in the next few years and I wanted that responsibility. I want to play the role Sanath has played." It was under Jayasuriya's captaincy that Dilshan made his Test debut, in 1999 in Zimbabwe. He made just nine runs in Sri Lanka's only innings, but before doubts could invade the youngster's mind, Jayasuriya wrapped a blanket of comfort around him. "'Dilly, just play this like an A team match,' he told me. That removed a huge pressure after the first Test," Dilshan recollects. Ten years on, Dilshan is coming to his father-figure's rescue. Jayasuriya's form was scratchy in the World Twenty20: apart from a dominating 81 against West Indies, the man who has hit some of cricket's most blistering knocks failed to find his feet. But Dilshan made sure he made up when "Sanath aiya" (elder brother) was finding it hard at the other end. He outscored Jayasuriya by miles (317 to 177), laying to waste opposition bowling attacks. Despite his own failure, Jayasuriya had a hand in Dilshan's second coming. "He has always asked to me play my game," Dilshan says. At the start of each innings the pair assessed the pitch before deciding on a feasible plan. Jayasuriya as the experienced old hand played navigator, drawing up the gameplan - which bowler to attack, when to rein in, and when to accelerate. That made Dilshan's job in the driver's seat much easier. "I know if I get a start I can go for runs and put the opposition under pressure in the Powerplay," Dilshan says. At the end of 2007, Dilshan was caught in a whirlpool mostly of his making. Immediately after wrapping up the home ODI series against England, he tied the knot with long-time friend Manjula Thilini. A month before, he had separated from his first wife, Nilanka. Thilini was an actress and the marriage invited plenty of negative press. Dilshan does not want to talk about whether his personal life had any bearing on his loss of form in cricket. Exactly a year after the second marriage, he was dropped following the four-nation Twenty20 event in Canada. He was furious at having to sit out ODI series against Zimbabwe and Bangladesh. "My wife heard me and said I should do what I'm comfortable with and not think twice. Her confidence helped me," Dilshan says. "I'm more free after my second marriage." 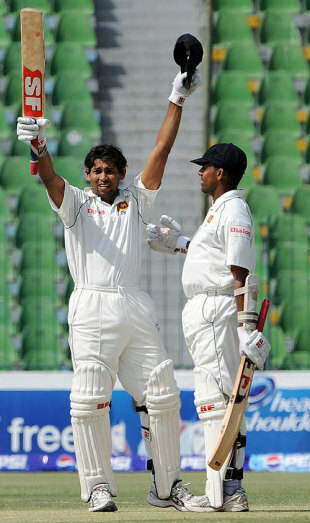 Dilshan first opened for Sri Lanka in a 2007-08 CB Series game against India. Immediately after India's innings Mahela Jayawardene told Dilshan he was opening. Dilshan put on his pads and scored a brilliant 62. But in the 18 games he played from then till the time he was dropped, he opened only another couple of times; he played at No. 6 on 13 occasions and once at No. 7. By the time he played for Sri Lanka again, in the Test series against Bangladesh in December 2008, he had made up his mind to become assertive about opening in ODIs and Twenty20s. He had done so successfully in domestic cricket in the two months away from national duties. "He is one of those players who could bat anywhere in the top six in any form of the game," Farbrace says. "Sometimes, when you are such a player who is so versatile, you don't nail a set position, and probably in the past that's been his undoing. Such a player can lose his spot when he has a slightly bad run, since he hasn't really nailed down a position of his own." Dilshan scored handsomely on the Test leg of the Bangladesh series, which prompted the selectors to recall him for the Pakistan tour, where he was Man of the Series. He carried that form into the IPL, for the Delhi Daredevils. He was promoted to No. 3, after having played at Nos. 6 and 7 in the first tournament. "I'm thankful to Viru [Sehwag] that he gave me the opportunity in the top order," Dilsan says of his Delhi captain. Sehwag asked Dilshan to play as he knew best, and Dilshan did not need any further motivation. It was during the IPL, when facing the bowling machine, that he started playing the scoop. He tried a paddle sweep against a short-of-length delivery and ended up flicking it over his own head. "'Wow, this is something,' I thought to myself, and tried to play it again. "It takes guts but I have the confidence to do it and I've been successful so far," Dilshan says, adding that he has not been hit in the face yet. The first time he played the shot in a match was against Deccan Chargers, when he scooped Ryan Harris twice. The shot, he says, offers him an alternative plan to deal with a length ball: he plays the paddle sweep usually to a yorker-length delivery, but to one pitched on a good length, he now has the option of the scoop. The stroke may be the most striking new thing about Dilshan's game, but also notable is how he has been playing a lot straighter, and giving himself more time to settle in. "Sanga and Mahela have given him that free rein to go and hit, but to do it responsibly and not recklessly," Farbrace explains. A touch of hot-headed recklessness was on show, though, in the IPL, in a game against Hyderabad. Dilshan and Fidel Edwards exchanged words as the fiery Barbadian sprayed a barrage of short-pitched stuff; one ball hit Dilshan on the helmet. Dilshan came out the winner with a handsome pulled six. "I told him to go and fetch the ball," he says, flashing another big smile.